The company’s success in creating a 160Gbps optical connection over several hundred kilometers has led it to promise it will be “commercialized in 2010 or after”. Other fat data pipes have been shown to carry gigabit-class data, but Oki’s method is different in that it can sustain the throughput over virtually unlimited distances. The key lies in something called optically regenerated transmission, a technology that prevents signal degradation with distance. 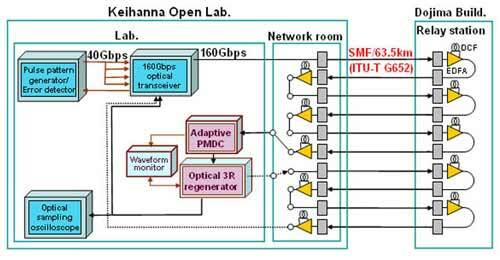 Conventional methods for long-distance connections require optical amplifiers every 50 to 100km. These convert optical signals first into electrical pulses and then back again, which is needed to correct signal and timing distortions. Oki’s new approach cuts out the conversion phase and keeps the entire process optical, thereby allowing a theoretical maximum speed of 200Gbps. With an eye on headlines, the company says its new data hose can supply the equivalent of four full movies every second, although any commercialization will, of course, not involve domestic consumers at first.